The Modern Essex Wood Flight Deck Sections comprise either 4 or 5 deck sections (depending on scale) cut from 3/32" basswood and are the approximate assembled size listed below. These decks feature countersunk 4-point tie-down rings and a lightly etched flight deck markings. The only portion of the Essex deck without catapults, arresting gear or elevators has been presented, the area just abeam of the island. The recommended color for a Vietnam War deck is Testors Model Master #1740 Dark Gull Grey (FS36231). The deck centerline striping should be done with Model Master #1745 Insignia White and #1708 Insignia Yellow (FS35381). The landing stripe area is painted Model Master #2034 Engine Grey (FS36076). The clear line is Insignia White and Model Master #1705 Insignia Red (FS31136). The unassisted takeoff line and the landing area edge stripes are Insignia White. Photos seem to indicate the Essex class carriers got the 4-point tie-downs during their FRAM (SCB-144) updates in the early 1960s. 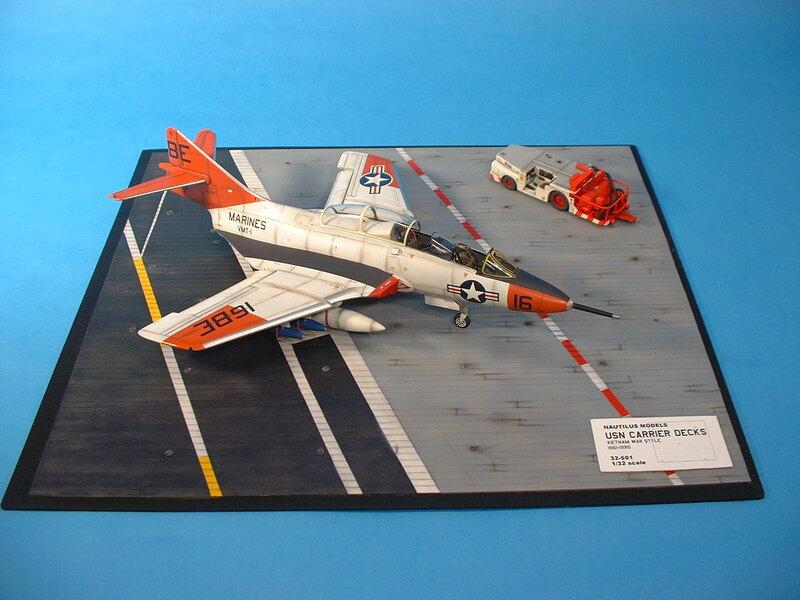 This deck pattern is currently found on all of the Essex class ships preserved as museums, making it possible to use this display base even for an SR-71! !